Medicare payment based on your performance. EHR technology (referred to as “advancing care information”), and resource use (referred to as “cost”). 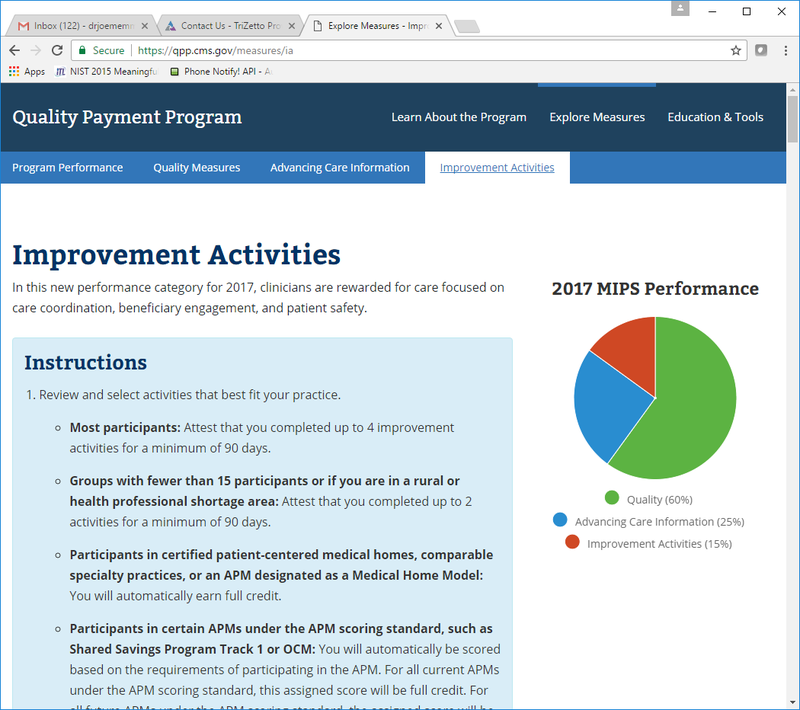 Click on this link to select quality measures and improvement activities. Please select 6 Quality Measures that are appropriate for your practice. The quality measures tab is the second tab. Please select 4 improvement activities that are appropriate for your practice. The improvement activities tab is the last tab on the right. Scroll down to see the 92 items for selection. 1. Engage Medicaid Patients, 2. Alcohol Screening, 3. Advance Care Plan, 4. Tobacco cessation. certified patient-centered medical homes and APMs. you performed for at least 90 consecutive days during the current performance period). intermediaries will need to certify that you performed the activities as indicated. subcategory or select activities from a certain number of subcategories. includes participation in a QCDR. category score, and each high-weighted activity is worth 20 points of the total category score. practice, and you do not select any activities, you will receive 0 points in this performance category. activity from the Integrated Behavioral Health Subcategory. performance category score, and a high-weighted activity is worth 40 points of the total category score. total of 40 points of the total category score. entire group (under the same Taxpayer Identification Number (TIN)) can still get full credit. reporting burden, and enhances clinical care. be removed, and will have to meet the full requirements of the performance category. * Activities for the improvement activities performance categories for consideration. the annual call fact sheet is provided below. Designed by Computer Consulting Inc.